There is a flurry of activity getting ready for departure. The crew is very focused checking that everything (and I mean everything!) is strapped down tightly. Then the authorities come on board to check passports and do an inspection. If all is in order we will be on our way shortly. Photos: Any job that requires moving things around on the deck is overseen by Bruce Cowden, the Chief Bosun. 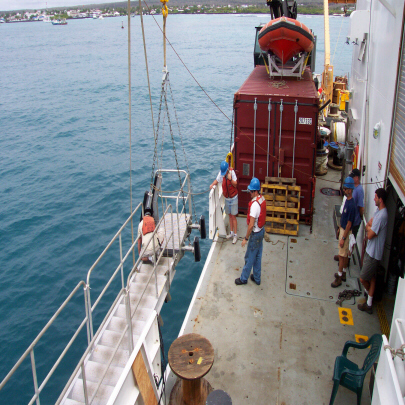 In the first photo you can see Bruce hoisting the gangway, and in the second he is leaning overboard to watch the lifting of the anchor. Bruce Cowden, the Chief Bosun, hoists the gangway. Bruce Cowden leaning overboard to watch the lifting of the anchor. We are now underway! The gangplank has been raised, the anchor (all 270 meters of it) is lifted and the ship is moving out to sea. Most everyone is standing on the decks outside taking their last photos of these fabulous islands. Goodbye Galapagos! Goodbye to Lonesome George (a huge turtle that is the last of his kind) and all the other gentle giants. Goodbye to all the beautiful herons, frigates, and blue-footed boobies! And finally, goodbye to all the friendly inhabitants of these islands that are working to preserve them for the future. 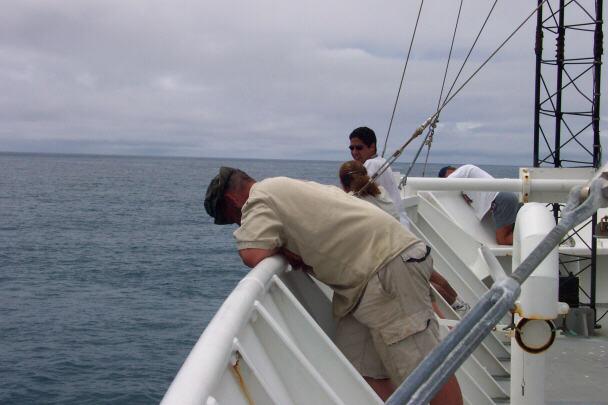 This entry was posted in 1990-2002, Jane Temoshok, NOAA Teacher at Sea and tagged Bruce Cowden, Chief Bosun, Galapagos, noaa ship ronald h brown. Bookmark the permalink.